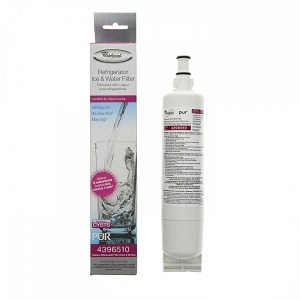 The Whirlpool 4396510 replacement refrigerator water filter features a PUR filtration system and fits side-by-side refrigerators with filter access in the base grille. This filter replaces part number 4392922 and is NSF certified to reduce the following contaminants in drinking water and ice: chlorine taste & odor, particulates, lead, mercury, cysts, asbestos, benzene, O-Dichlorobenzene, p-Dichlorobenzene, toxaphene, endrin, ethylbenzene, and turbidity. 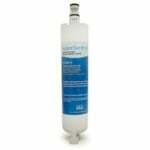 This Whirlpool refrigerator filter will not remove beneficial fluoride in your water. This KitchenAid refrigerator filter features quick and easy 1/4 turn replacement and should be replaced every six months for optimal results. The Whirlpool Everydrop EDR5RXD1 is an updated version of the Whirlpool 4396508, 4396510, 4396918, 8212491, and 8212652. Click here to find out what's new! 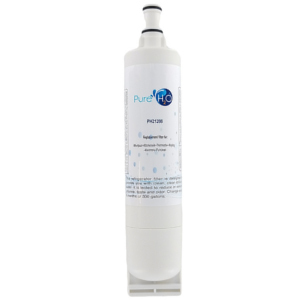 The PureH2O PH21200 is the compatible replacement for the Whirlpool 4396510. It features a carbon activated filter media that serves as the bridge between the filter and the water. Through this carbon filtration media the problems that are affecting your water like chlorine taste and odor are resolved. The carbon filter media inside the PH21200 acts as a chemical absorbent to make your water smell and taste better. PureH2O recommends replacing the PH21200 every 6 months for superb water filtration.